Based on the hit comic book by Tomoko Ninomiya, this is a fun-filled quirky romantic story of two very opposite people. They meet by accident. Nodame quickly falls in love, but it takes much longer for Chiaki to even begin to appreciate Nodame’s unusual qualities. Their relationship causes them both to develop and grow. 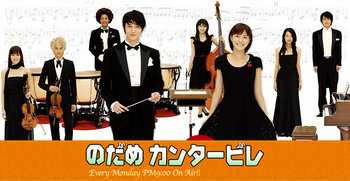 Because of Nodame, Chiaki transfers into the Conductor Division, leads a student orchestra and begins to have a broader appreciation of people's musical abilities. Because of Chiaki, Nodame faces her fears and enters a piano competition. Opportunities open up as both begin taking risks, stretching themselves far more than they ever thought possible.